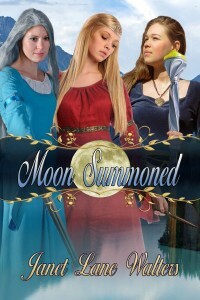 Three Moon Summoned women. Ashiera the Seer who controls the winds and sees into the thoughts of others. Dian the Warrior who controls fire and fights with the sword. Egeria the Healer who controls fluids and heals those who are injured. They are joined in their battle by Sieper a sailor who knows the winds, Kobe once sworn to the Lord of Shadows and Jetan a healer of animals. These three vow to help the three women against those sworn to Evil. Lugal the Cabal reads the winds and thoughts. Sargon the Gladius controls fire and the armies of the Lord of Shadow. Lugal the Cabal has knowledge of herbs and uses them for evil. These three with their cohorts will face the three and three sworn to the Mistress of the Moons. Janet Lane Walters has written a story that will take you to another time and place. She gives vivid descriptions of her characters and their role in this story. Ms. Walters has constructed a civilization so real that you will feel its very existence. A place where men rule women as chattel for their sexual needs, and three evil rulers who drain their bodies of their very essence for spells and to gain power. There is betrayal and treachery inside of plots, as each priest plans to rule alone. Ashiera, Egeria, and Dian are bound to the spirits of the ones who came before them. They discover a truth that will astound them, and have them doubting their chosen path. They will experience a love that is forbidden and discover that two stand together better than one. I could feel the emotional struggle between love and destiny, described so passionately by the author. I hope Ms. Walters plans to continue this story. I could feel that this is just the beginning of this tale. Janet Walters book, Moon Bright, Moon Dark will go on my keeper shelf, beside such authors as Charlotte Boyett-Compo and Nancy Gideon. I give this story Five Hearts and recommend it highly. Enjoy!